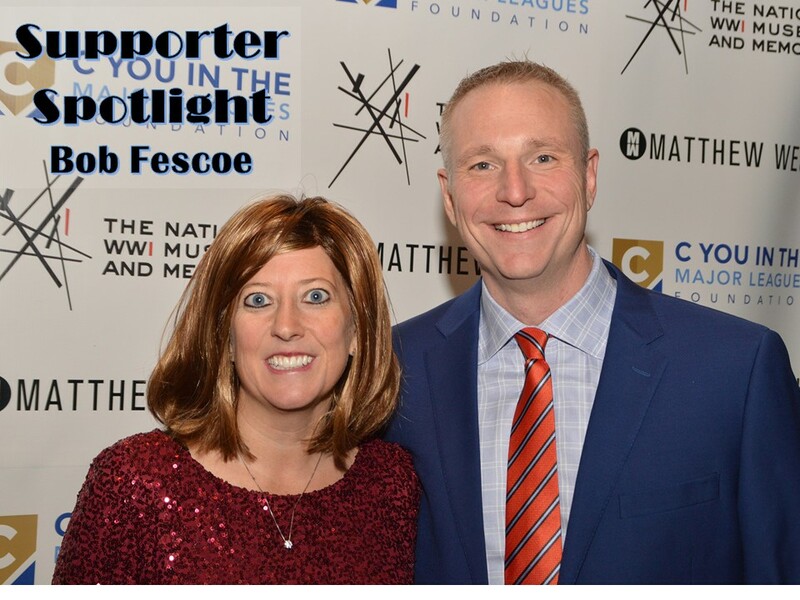 Bob Fescoe and his wife Jen at the “C” You In The Major Leagues Donor Appreciation Event/Christmas party in December 2017. Photo by Brian McDonell. You’ve been a “C” You In The Major Leagues supporter since, at least our inaugural “Wiffle Ball at the Hollow” in 2017 (and now you’re on the committee for the 2019 Crown Town Wiffle Weekend). What made you want to get involved initially? Bob Fescoe: I think the thought of playing Wiffle ball was cool but to see how we can help families in Kansas City was cooler. As I have gotten older, I have developed a passion for helping out others. We see so many folks who need help, and if you have the ability to help someone out it really can make a difference. I just love to be associated with folks who are willing to put others ahead of themselves and CYITML really does a great job of putting others’ needs first. What is your favorite aspect of what “C” You In The Major Leagues does? BF: Helping kids and seeing how CYITML makes an impact in the lives of young people. I think it’s important to have an impact on the young folks of our city so they can carry what they learn at a young age into their adult lives. Why is the work important that CYITML does in this community? BF: It gives folks a chance who otherwise may not have an opportunity. Any time you can present someone with an opportunity and they are able to take advantage of it in a good way is a win. Even though you’re a KC transplant, we’ll say, what’s your favorite Royals memory? BF: October of 2014. That is when I learned the impact sports can really have on a community. We met so many folks that used the Royals run as survival. Some fought cancer. Others used the Royals to forget about their every day issues some used it to escape reality and it united the city. It didn’t matter who you voted for, where you grew up, or what side of the state line you called home, the baseball team united this town and turned KC from a town that always said “We can’t,” to a town of “Heck, yes, we can.” That was unreal. BF: Don Mattingly and John Madden! I played first base and loved Mattingly. But then, by the time I turned 8 I realized I would never be a pro athlete so I turned my attention to John Madden! Why do you continue to support CYITML? BF: It feels good to help others. It’s a feeling I can’t really explain. What’s one thing you’d like people to know about “C” You In The Major Leagues? BF: This is an organization that really strives to make a difference in Kansas City. In the few years that they have been around you can see the tangible difference they have made. You see kids getting opportunity, you see families getting help when they are in a tough spot, and you see people becoming better right before our eyes. These guys make such a big difference for folks in Kansas City.